Did you ever have one of those teachers in school or college who were famous for their drab and monotonous lectures that put most of the class to sleep? Nobody enjoys such lectures, do they? Blogging is similar. If your blog content sounds like a boring lecture, it won’t find too many takers. Your blog content should capture your readers’ interest. It should be full of life. It should be full of zest. So how do you add enthusiasm and energy to your blog content? How do you show your zest for blogging through your blog and its content? How To Show Your Zest For Blogging? Show Your Passion About Your Blog Topic. This is one point that cannot be emphasized upon enough. Nothing adds zest to your blogging as strongly as your passion for the subject you blog about. Show Your Spiritedness By Being You. Developing your own voice in blogging can be challenging. It takes courage to be 'you' and to share your story with strangers on the internet. But it makes you come across as a blogger with so much peppiness. Show Your Liveliness In Your Writing Style. Whatever style of writing you choose, make it lively. Make sure it conveys great vigor and vitality. Make sure it keeps those yawns away and those eyes wide open. Show Your Buoyancy In Your Comments. Respond to comments cheerfully and with a smile on your face. Let the effervescence in your replies show that you are genuinely delighted to hear from your readers and to interact with them. Show Your Zeal To Accomplish. Set yourself challenging targets. (e.g. this A to Z Challenge) And then meet them. Make blogging commitments. Say them out loud on your blog. And then keep those commitments with fervor. Show Your Appetite For Learning. Blogging involves a constant learning curve, both in blogging as well in the subject you write on. Having an insatiable hunger for learning new skills and new strategies will reflect your exuberance. Show Your Dynamism In Evolution. The blogging world is constantly evolving and you must keep up with the change. Be quick to adapt to the latest developments in the blogosphere—if not all, then at least the ones relevant to your niche. Show Your Enjoyment Of Blogging. Lastly, your blogging should reflect your joy and excitement with the entire process, right from researching to creating to marketing to social engagement and community building. It should show your love for what you’re doing. Many people start blogging, but most give up after a few months. It isn’t due to lack of skills, but, because of lack of zest. It is easy to maintain enthusiasm and verve for the first 2-3 months, but to keep the fire alive month after month and year after year requires a lot of energy. Does your blog have this energy? How do you ensure that your zest for blogging shows through your blog and its content? How do you keep your blog from getting boring? This is my 26th (last) post for 2015 AprilAtoZ. 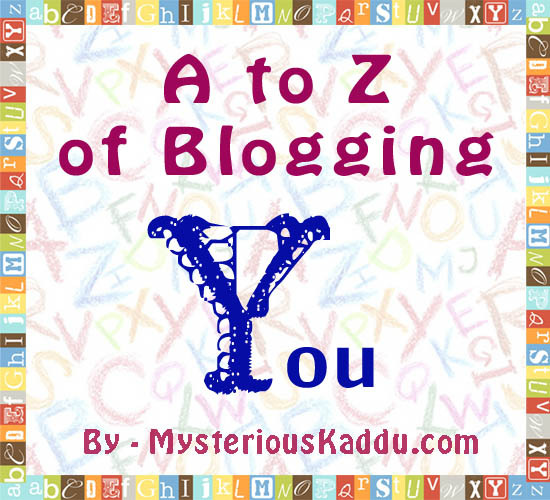 Link to the previous post: A to Z of Blogging: Y - You. Regardless of how much thought and effort you put in branding your blog elements, the main blog identity comes from YOU. It is your personal touch that keeps readers coming back. It is that part of your personality that you put into every aspect of blogging—be it designing or writing or reader engagement—that creates the real brand for your blog. When I was working for Dell Technical Support, the most common feedback I got from my callers was that I “don’t sound like a machine or robot, I sound like a real human being.” Probably for this reason alone, my CSAT (Customer Satisfaction) scores used to be among the highest on the floor. So why is it so important to add your personal touch to your blogging? What benefit does it give? Why to Add Your Personal Touch to Your Blog Content? It lets your readers know that you are a real person and not a computer program generating automated content. It allows your readers to relate with you and understand where you come from. It helps in creating a mental and emotional connect and a feeling of bonding. It builds trust and credibility, leading to better conversion rates, as people are more inclined to follow the recommendations of those whom they trust. It helps your content stand out from the rest, giving it an element of originality. So how do you add this vital “personal touch” to your blog content? Your blog might not be about your personal memoirs. It could be about gardening or parenting or cooking or electronic gadgets or anything under the sun really. Still, how do you make it about YOU? How to Add Your Personal Touch to Your Blog Content? Choose A Topic Of Personal Interest. I agree that some blogging niches offer better monetization options than others, but as Rancho advices in the movie 3 Idiots, don’t pursue success; strive for excellence and success will follow on its own. So choose to write on something that you’re passionate about. Your love for the subject and your knowledge of it will show in your content. Pick A Natural Writing Style. Don’t imitate others. Write in a manner that comes naturally to you, because that becomes “your voice”. Over time, your readers begin to identify “your voice”. It is okay to experiment once in a while to find out what works best for you, but, in the end, you must remain true to your own style. Share incidents from your life that relate to the topic you’re writing on. For example, earlier in this post, I mentioned that bit about my experience at Dell because it’s exactly what this article is about. Even if you blog anonymously, i.e. under a pseudo name, you can still throw in small life anecdotes every now and then, to convey your message more clearly, or to validate your claims, or to support certain facts. At times, it is okay to brag about certain achievements on your blog. It tells your readers that you really know what you’re talking about. It helps in building that trust that we talked about above. So go ahead and share the link to that interview you gave or that award you won. Let your readers know if your work has been published somewhere. Tell them how you proved to be the “knight in shining armor” for a “damsel/dude in distress”! Just as important it is to talk about your achievements, sharing your mistakes is equally important. Mistakes are a part of the learning curve. They tell your readers that you’re as human as they are, you’re subject to the same constraints and errors of judgment at times, and that you’ve chosen to learn from your mistakes. This adds a lot to your credibility and builds respect for you. So these are 5 ways in which you can (and must) add your personal touch to your blog content, without making it your personal memoir. The trick is to make your blog content about you, without making it all about you. Do you use any of these ways to lend a personal flavor to your blog content? Do you use any other ways? Are you, as a reader, better able to relate with blogs that have an element of personal touch in the content? This is my 25th post for 2015 AprilAtoZ. 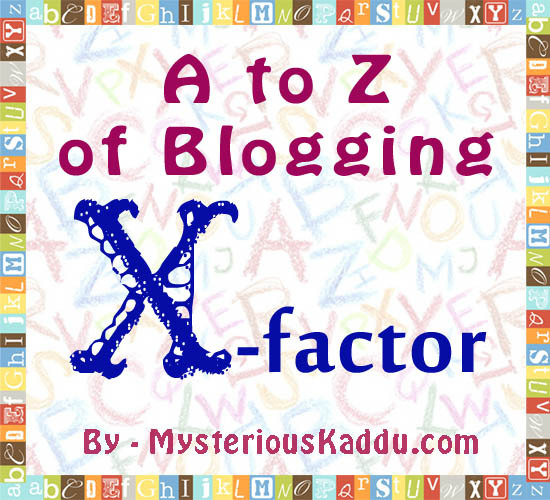 Link to the previous post: A to Z of Blogging: X - X-Factor. Earlier in this series, we discussed how to make our blog stand out in the blogosphere with the help of “branding”, but that was only about the blog. It dealt with blog elements, such as the blog name, domain name, blog header etc. We never got around to discussing how to make our blog content stand out. Have you noticed how some people’s blog content speaks out to us? A post might be long and drawn out, and yet manage to keep us hooked till the last word. Or it might just be a 55-word fiction, but it continues to linger in our minds long after we’ve read it. So what is that distinct flavor that adds that special punch to some people’s blog content? What is that X-factor? Based on some astute observations, followed by a shrewd analysis of those observations (READ: “speculation”! ), I have compiled the following list of possible ‘X-factors’ that can lend that extra quality to your blog content that makes it stand apart. How to Add the X-Factor to Your Blog Content? I had this Math teacher at my school who constantly joked around with us and used a lot of funny anecdotes in teaching. I still remember the things he taught us – even in trigonometry! It’s amazing what a bit of humor and enthusiasm can do! It can turn an otherwise drab content into something that stimulates and rejuvenates the reader’s mind. Blog content that connects with readers leaves a longer lasting impression. It can be anything that the readers can relate to. It can be an answer to their questions or something that happens in their day-to-day life. It can be something that inspires them or touches an emotional cord. Blog content that is presented in simple, conversational style usually works well for most bloggers. If readers want heavy jargon, they can easily refer to Wikipedia, right? I’ve covered this point in greater detail under ‘Y - You’, but in short, personal touch is 'your voice'. It is your personality. It is a cumulative sum-total of your experiences. If you develop your own unique ‘voice’ for your work, it automatically identifies your content from the rest. Sometimes, a complimentary image or video adds that extra “kick” to your own content. Or you can add quotes to maximize impact of certain sections of your content. You can also use infographics. These are the things you can do to add that “X-Factor” to your blog content. These elements will add that extra quality to your blog content that will make it stand apart and will keep your readers hooked. What role do you think the X-factor plays in popularity of blog content? Do you have an X-factor in your blog content? Is it among the ones listed above? Is it something else? This is my 24th post for 2015 AprilAtoZ. 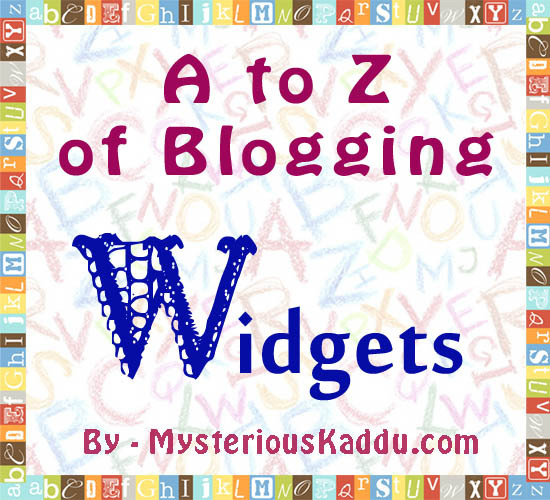 Link to the previous post: A to Z of Blogging: W - Widgets. Widgets (or “gadgets” in Blogger) are those small applications that bloggers put in their blog sidebar or footer or below the posts section. They serve so many different and, sometimes, very useful purposes. There was a time when I had a dozen odd gadgets in my blog’s sidebar. I had games like ColorJunction, Mahjong and Sudoku. I had my Personality Test results from Youniverse.com. (I was ENFP back then.) I had a gadget that displayed a random quote every day. I even had a Yahoo Messenger Pingbox embedded as a widget. I used to be online on Yahoo Chat all day back then, and we planned a crazy bloggers’ meet in Delhi via that Pingbox. It was fun! Blogging has evolved now though. It has become more professional, even if you’re not blogging professionally. All those funky gadgets that were the craze back then are, now, seen as clutter. They increase the site loading speed and act as a distraction from your main content. Today, the widgets or gadgets on your blog should be added with only one thought in mind – making it as easy as possible for the readers to access and engage with your content. Here are 5 blog widgets that I strongly recommend. The search box gives a quick way to your readers to find something specific on our blog. It could be a post they visited a few days ago, but couldn’t bookmark it at that time. Or it could be an article you wrote long time ago that a blogger friend wants to link to now. Search box should ideally be in the top-right part of your blog. Different people use the internet in different ways. Some use only email. Some hate email newsletters. Some are more active on Facebook or Twitter. Some might like to have their subscriptions nicely organized in a feed reader. You must offer your readers all popular ways of subscribing to your blog content (RSS, Email Subscription, Facebook, Twitter, Google+, Wordpress/Blogger Follow etc.). A reader might want to contact you with a query, or a prospective client might be looking to work with you. Someone might want to contact you for a sponsored post or some other advertisement deal. An author might want to connect with you for a book review. So you must display your contact options clearly. Recent Posts / Related Posts / Popular Posts. I see so many blogs that don’t have any widgets to showcase the “other” content on their blog. That is such a big mistake. If a first-time visitor lands on one of your posts and likes it, he will definitely want to check out some more of your content before deciding to subscribe. You must have at least the recent and related posts widgets, and not just on your home page, but on every post page. If you want more visibility for your content, make sure you have easy-to-use social sharing buttons on every post of your blog. The readers should have an option to easily share your content on at least Facebook, Twitter, Google + and Pinterest. At least. These are the 5 essential widgets that every blog must have. Ideally, they should all be as close to the top of your blog as possible. All other widgets (such as traffic counters / page ranks, Blogroll, blog awards, links to the blog networks you’ve joined, and whatever other widgets you have) should be below these. Does your blog have all the 5 widgets listed above? Which of these 5 do you find the most useful when you visit other people’s blogs? Are there any other widgets that you would recommend in the must-have list? This is my 23rd post for 2015 AprilAtoZ. 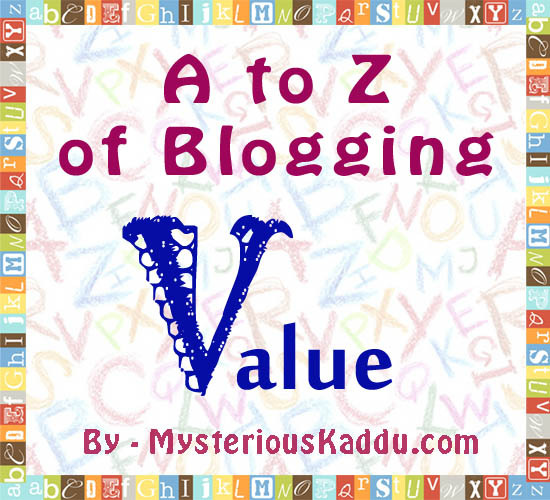 Link to the previous post: A to Z of Blogging: V - Value. As I said in an earlier post in this series, our blog readers are our primary asset in blogging, unless we’re keeping a sort of private diary online, which I don’t think most of us are doing! So it becomes essential to give value to our readers through our blog. It becomes essential to make it worth their time to read our posts. And how do we do that? How do we ensure that our blog does offer something of value in exchange for our readers’ time? How do we give the best possible experience to our readers on our blog? How to Give Value to Your Blog Readers? I’ve already covered these points individually earlier in the series. So I’ll just give a brief summary here to refresh your minds. You can visit the linked posts to read the full content of those articles if you missed them earlier. Having an idea of who reads your blog content helps you tailor your content to meet their requirements and it also helps you deliver your content in ways your readers can easily access. Content truly is king. If your content does not offer anything of value to your readers, they will not visit your blog again. Remember those 5 questions. “Is it useful? Is it accessible? Is it readable? Is it understandable? Is it original?” Strive for quality, but, not perfection. If you have great content, then a user-friendly design showcases that content to your readers effectively, and helps them access it easily. Your blog design should take care of both the aesthetics as well as the functionality. The best way to encourage engagement on your blog is to make the interaction options visible and easy to use. Whether it’s the comment form or the social sharing buttons, the newsletter sign-up box or other subscription options, they should all be prominently displayed. Also, make it a point to respond promptly to all comments and queries you receive. Whether you decide to post daily or weekly or fortnightly or 5 times a day, just fix one posting schedule and then stick to it. If you maintain consistency in your blog updation schedule, your readers will know when to expect new content on your blog and they’ll "fit" your blog in their "routine". Bottom-line is that if we have a blog that other people read, i.e. if it’s not a private blog, giving value to our readers must be our first and foremost goal. It doesn’t matter whether we blog professionally or as a hobby, or even if we have a niche or not. We just need to ensure that our readers feel as appreciated as we do when they read our content. Do you believe it is important to ensure that your readers are getting enough value for their time? Do you attempt to do this on your blog? What ways do you use? This is my 22nd post for 2015 AprilAtoZ. 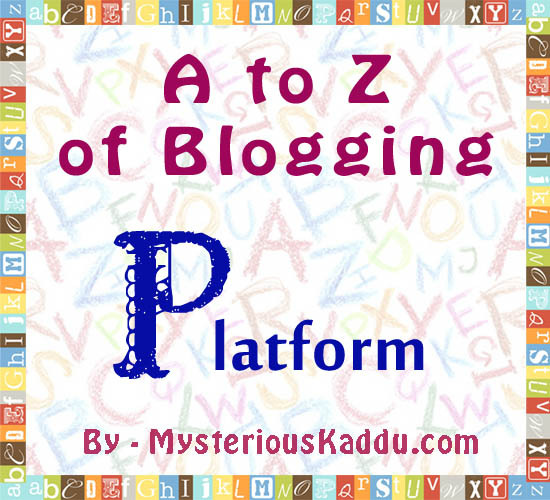 Link to the previous post: A to Z of Blogging: U - Updation. There is a never-ending debate in the blogosphere about the update frequency on your blog. Some bloggers say you should blog daily, some tell you to blog not more than thrice a week, and some advice a posting schedule of several times a day! So whose advice do you follow? You decide for yourself, based on the points mentioned below. First, let’s take a look at the pros and cons of high updation frequency on blogs. Google loves fresh content. Blogs that get updated frequently are better ranked on search engines, provided you’ve taken care of the SEO aspect of your posts. More new content means that there are more of your posts on search results pages, i.e. more “entry points to your blog” for new visitors, who find your blog through search engines. If a news channel showed the same news for a week, how often would you watch that channel? Same way, if you don’t give new content to your readers for days on end, why would they visit your blog repeatedly? Posting too often on your blog can affect you as a writer. It can drain you physically and mentally. It can affect your writing quality too. This is known as “writer burnout”. Too high update frequency doesn’t give much time for conversations to happen in the comments forum. The “commentariat” are forced to move on to your next post. You are also busy writing your next post instead of replying to comments on your last post. Based on the above pros and cons of high update frequency, here are 6 pointers that should help you decide how often you ought to update your blog. How fast do you want your blog to grow in readership? For slow growth, post weekly or fortnightly. For moderate growth, post 3 times a week. For steady growth, daily posts are recommended. For fast growth, you need to post 3-5 times a day. If your blog is new, you need to focus on marketing more than content and readership. You must spend time finding other blogs in your niche and commenting regularly on them. You must submit guest posts on other blogs and article directories to establish yourself as an expert and gain some “backlinks”. Moderate update frequency is good during this period. A blog on diverse subjects and many categories performs better with update schedule of more than once daily. Readers expect such blogs to be updated more frequently. Besides, these blogs usually offer selective subscription options. You can subscribe to a specific category only if you like. If you depend on search engines primarily for your blog traffic, then it makes sense to have a higher update frequency for your blog. (As discussed in the pros above.) But, if your readers are regular subscribers or those who have bookmarked your blog, then you should try to keep it moderate or steady. If you write long, detailed, informational posts on a regular basis, then a posting schedule of once a week is good. It gives you enough time to write and it gives the readers enough time to absorb what you’ve written and have their queries answered via comments. Shorter posts can be published more frequently. Group or multi-author blogs can have a higher update frequency, as there is less likelihood of writer-burnout. Single author blogs should stick to slow or moderate growth. Even daily posts can result in fatigue. Whatever blog update frequency you decide eventually, be sure to maintain consistency with it. If you’d like to experiment with it a little, don’t make the changes too abrupt, or at least inform your readers about what you’re doing. You can even conduct a poll and ask for their opinions directly. Do you have a fixed blogging schedule currently? How often do you update your blog? Is it working for you? Or do you think you ought to change your update frequency? This is my 21st post for 2015 AprilAtoZ. 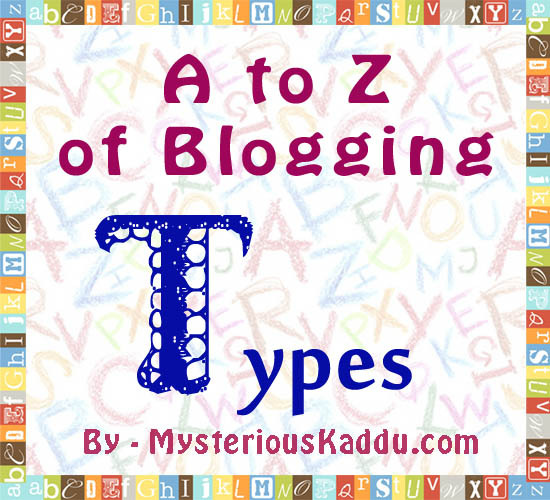 Link to the previous post: A to Z of Blogging: T - Types. 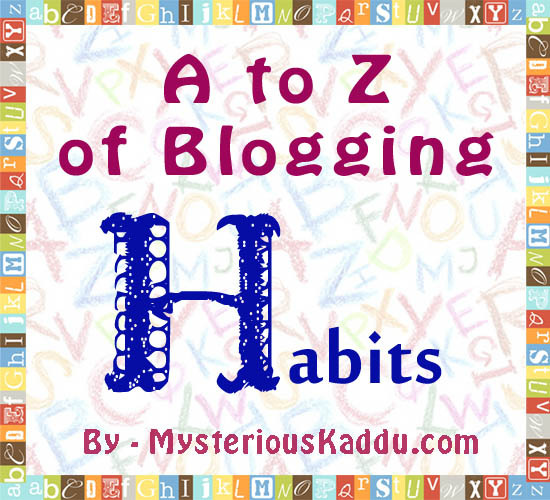 Remember those terms for blogging habits that we covered under ‘H for Habits’? Today, I’m going to share terms that the blogerati have come up with, for the different types of blogs, blogging and bloggers. And who are these “blogerati”? You’ll know in a minute. Photoblogging – When you’re posting primarily photographs and images. This is what we usually do when we decide to participate in the “Photo A Day” challenges on our blogs. I have indulged in photoblogging here only during three months (March 2012, May 2013 and June 2013), but there can be dedicated “photobloggers” too. Vlogging – Short for “video blogging”. When the blogger, known as “vlogger”, posts videos as his/her main blog content. Audioblogging – When “audiobloggers” publish audio files (MP3s or other music formats) as their main blog content. Moblogging – When a blog is updated and maintained via a mobile phone by “mobloggers”. Problogger – A professional blogger, i.e. one who blogs as a profession. Blognoscenti – The fraternity of the most knowledgeable bloggers. Blogebrity – A very famous blogger… a blogging celebrity. Blogerati - The cumulative “intelligentsia” of the blogosphere. Commentariat – Collective term for bloggers who leave comments on other blogs. Dooced – Any blogger who lost his job because of the content posted on his blog! Some classification, right? Like I said in the beginning of the post, you’ve got the blogerati to thank, for coming up with these creative terms for types of blogs, bloggers and blogging! There are many more such words in the blogging vocabulary nowadays. Just do a Google search for them sometime. You’ll be happily amazed! Do you or your blog classify into any of these types? This is my 20th post for 2015 AprilAtoZ. 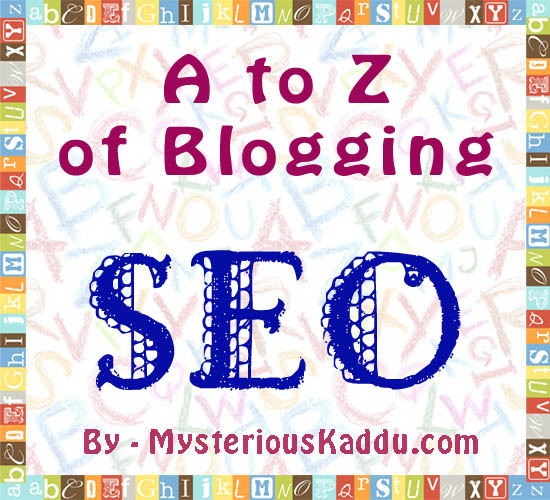 Link to the previous post: A to Z of Blogging: S - SEO. publish content that they can relate to. promote our content via channels that they’re comfortable with. offer subscription/following options that can be of use to them. So what kind of information do we need to know about our blog readers, so that we can connect better with them? What to Know About Our Blog Readers? And how do we find out all this information about our blog readers? How to Know About Our Blog Readers? Google Analytics gives us data about their location, as well as the technology they use, source of traffic, and the search phrases that bring them to our blog. Alexa also gives information about their age group etc. I find Histats pretty useful to track what day-of-week and time-of-day my readers choose to be active. I do this at times, especially when I’m making some changes in the blog design. It is always best to ask our readers directly about their likes and dislikes. The comments section can also provide a lot of information about our active readers, viz. who they are, whether male or female, their feedback, their queries, etc. We can start conversations with them through the comments, and get to know them more personally. Eventually, we can carry the relationship forward onto emails. Many of our readers don’t like to comment on our blog directly. Instead, they give their feedback on social media sites, like Facebook and Twitter, when we promote our posts on those sites. Some email subscribers prefer to just email us directly. By keeping a track of these little details, we can understand what social media channels are used more by our readers, and promote our content accordingly. Many of our blog readers are bloggers themselves. So the best way to know them better is by checking out their space, i.e. their blogs, and by paying attention to what they write about. In business, the rule is “know your customers”. In blogging, it is “know your readers”. Better understanding of our audience helps us deliver content that is better appreciated. If we’re blogging to make money, this translates to more effective monetization. If we’re blogging for the networking and for making friends, this helps in forming stronger connections with our readers. So who are your blog readers? Do you use any of the above ways to understand your readers? Do you use any other ways to do so? Does knowing your readers help you in deciding what to post? This is my 18th post for 2015 AprilAtoZ. 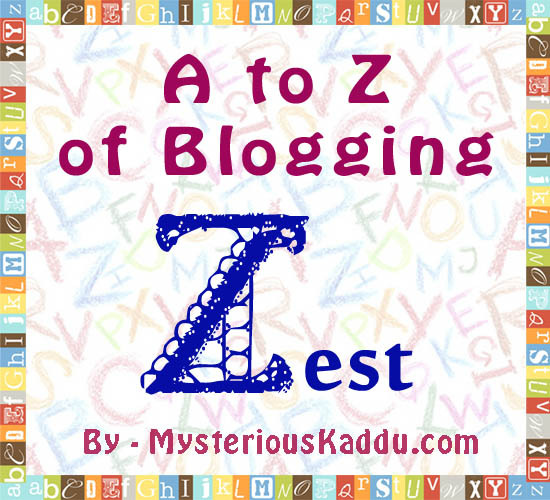 Link to the previous post: A to Z of Blogging: Q - Quality. One of the biggest challenges in starting a blog is, perhaps, deciding which blogging platform to choose. There are many options available: Wordpress, Blogger, Typepad, LiveJournal, Wix, and Tumblr, to name just a few. Some of these blogging platforms are free, some are paid, and some offer premium services in their paid versions. They all have different sets of features and require varying degrees of technical skills to use them. Most popular of the lot are Wordpress and Blogger, and there’s a never-ending debate on which of these two is better. To be completely fair though, the debate should be between THREE and not TWO. Wordpress.com and Wordpress.org are two separate blogging platforms. My own blogs are all hosted on Blogger. I have made some professional websites too on Blogger, to save on hosting costs for my clients. That doesn’t necessarily mean that you should go for Blogger too. It works for me, but, it might be totally wrong for you. In this article, I will let you decide which of these three blogging platforms is best for you based on your specific requirements. I am giving details of the three main blogging platforms in use today: their usage cost, pros and cons, as well as what type of blogs they are most ideal for. Hopefully, these details will help you pick the most suitable blogging platform for your blog. About $80-90 a year for domain and hosting. Easy to post, upload and customize. Thousands of free themes and plugins. Storage space only limited to hosting plan purchased. Setting it up on own hosting requires moderate levels of technical skills. Hosting being from some third-party, is not as secure and reliable as hosting on Blogger or Wordpress.com. Also more prone to malware attacks. Professional bloggers and business owners. Multi-user blogs with varying access levels. None for subdomain blog (i.e. xyz.wordpress.com). $13 a year for mapping your own domain. $18 a year for buying a domain through them. Free reliable hosting on Wordpress.com servers. Easy to setup (can start blogging in 5 minutes). Easy to post and upload content. Many built-in plugins and widgets. Limited functionality, unless you pay for upgrades. Have to pay for own-domain mapping too. Restricted to default themes and in-built plugins and widgets. No access to template code to modify the HTML/CSS. Limited support for advertisements to monetize your blog. Limited storage space for all content – text and images. None for subdomain blog (i.e. xyz.blogspot.com). None for mapping your own domain. Free reliable hosting on Google servers. Can setup with your existing Gmail user ID. Thousands of free third-party themes that can be used in place of default themes. Allows full access to template code to modify the HTML/CSS and add “hacks” for various plugin functionalities. Unlimited storage space for text content. Fully customizable with some webdesign skills. Or you can also get your custom blog design from a professional, at a one-time cost. Very few default themes and widgets. Moderate coding/design skills needed to make any kind of customizations. No option to self-host (not even a paid one). No option to password protect individual posts. Limited storage for images on Google Picasa. Doesn’t work that well with heavy traffic. Multi-user blogs not requiring too many access levels. My preferred blogging platform, at the moment, is Blogger. All my blogs are single-user blogs, with moderate traffic. Plus, I have design skills, so I can customize my blogs any way I want, at no extra annual cost (besides the domain name). Which blogging platform do you use? Blogger? Wordpress.com? Wordpress.org? Any other? Are you happy with it? Would you have chosen differently if you knew better? This is my 16th post for 2015 AprilAtoZ. Link to the previous post: A to Z of Blogging: O - Originality. Most new bloggers, who start blogging without any formal training, tend to run a diverse or multi-topic blog. This is perfectly okay if you don’t have any plans to make serious money out of your blog, but, if you want to make blogging your primary source of income, then you’d be better off with niche blogging. Niche blogs are dedicated to specific topics. So if it’s a blog on finance, you won’t suddenly see a weight-loss article on it! The content published on it will usually be about taxation, banking, investments… all finance related topics. Niche blogging is better than generic multi-topic blogging in several ways. 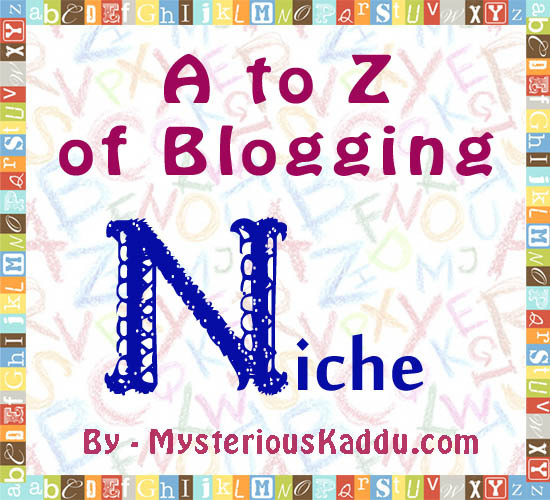 What Are The Benefits Of Niche Blogging? Updating A Niche Blog Is Easier. Instead of hopping around from one topic to the other, you remain focused on one specific subject. Naturally, you’ll pick a subject you’re passionate about, and when you write with passion, on a topic that you love, words flow on their own. Updating niche blogs, therefore, becomes so much more effortless and so much more fun. You Get Recognized As An Expert. When you stick to blogging regularly about one specific topic, you start digging deeper into it. You become more knowledgeable about that subject. You may have started as an amateur, but, you gradually build up the credibility of being a subject matter expert in that niche. You can then offer consultation services or courses or publish your own books or even get speaking gigs and job offers. Helps In Getting Loyal Readers. Niche blogging brings thousands of loyal readers to your blog. These are people who have an interest in the subject you blog about. You will not be able to retain too many readers if you keep jumping from one topic to the other randomly. If a person has subscribed to your blog expecting articles on photography, he will not stick around if you suddenly switch to writing about something else. Better SEO, Leading To Higher SERPs. When you focus on one single topic on a blog, and you cover it in exhaustive detail on that blog, Google also considers you as an authority on that subject. That helps in your blog's SEO and improves your blog’s position in search engine results. There is something called keyword density. If you have the optimum keyword density on both a particular post as well as your entire blog, your blog’s content gets ranked higher for that keyword in search results. Niche blogs attract more targeted ads from ad networks, and deliver these ads to their target audience. For example, if you have a dedicated blog on books, the ad networks will deliver ads related to books and, since your readers will also be book lovers, they’ll be more likely to click on those ads and buy something from the advertisers. For this reason, niche blogs get better rates on ads. I have seen very few really successful multi-topic blogs (in terms of monetization). If you have varied interests, it is better to create separate niche blogs for the topics you usually write on, rather than stuffing them all in one blog. Niche blogs are good for the readers, they’re good for Google, and they’re good for you. What kind of blog do you have? Is it a multi-topic blog like mine? Or is it a niche blog? Have you noticed any difference in the earnings from both types of blogs? This is my 14th post for 2015 AprilAtoZ. 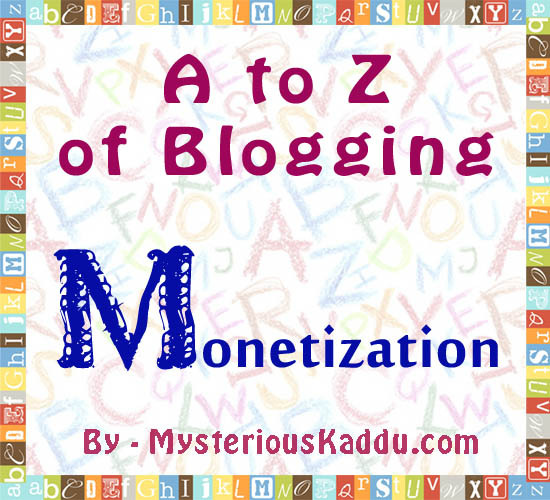 Link to the previous post: A to Z of Blogging: M - Monetization. The blogging world is a gigantic collection of ideas, information, experiences and expressions. It is not just a simple collection though; it is more like one big kaleidoscope. 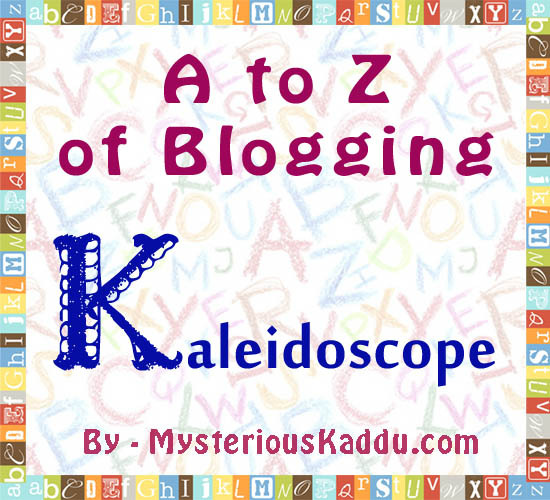 So how does the blogosphere fit into this definition of a kaleidoscope? Same Fragments - Many Patterns. In a kaleidoscope, the same fragments of colored glass form a different pattern with each turn of the tube. No two patterns formed are ever exactly alike. Blogging is similar. Take for example, this A to Z challenge. We all have the same 26 fragments, yet each blog is creating a completely different series with those fragments. Shilpa is writing a 55-word fiction every day on human emotions. Sanch is posting a limerick a day on phobias. Rajlakshmi is covering the Yogasanas. And I’m compiling a series on blogging. Patterns formed in the kaleidoscope don’t remain static. They keep on changing. So do blogs. They change. They evolve. With respect to content, as well as design. When I started blogging here, I used to write mostly philosophical or inspirational stuff. Since then, I’ve tried my hands at photography, creative writing, posting book reviews and recipes, writing informational articles, and a variety of other things. A kaleidoscope is made up of an eclectic mix of fragments of glass or bits of colored plastic. Blogs are also composed of an assortment of different topics and writing styles. Some are more diverse than the others. I suppose, it is this variety of content that makes blogs so dynamic in nature. I had a kaleidoscope when I was a kid. A green colored one. It had tiny plastic pieces inside – some long, some round like beads. I could sit with it for hours and watch the different patterns emerge as I moved it slowly in my hand. Now, I do the same in the blogosphere – watch the kaleidoscopic world of blogging unfold in front of my eyes. What about you? Are you as fascinated by the kaleidoscope as I am? And are you amazed by the variety and dynamism in blogging? This is my 11th post for 2015 AprilAtoZ. 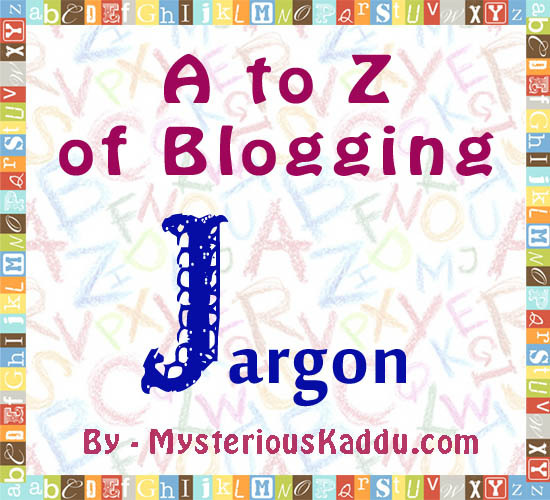 Link to the previous post: A to Z of Blogging: J - Jargon. When I started blogging, I used to get very confused with all the jargon associated with it. The blogging technology was changing rapidly in those days, with new features being rolled out every few months, and I just didn’t want to keep pace with it. I now re-design entire blog templates as per my requirements, but you’ll be surprised to know that there was a time when my blog readers had to make a “group appeal” just to make me add the “follower” widget on this blog! Here are a few blogging terms that had me stumped for a long time in my early blogging days. Short for “Completely Automated Public Turing test to tell Computers and Humans Apart”. It is a security feature in blogs to help block automated spam comments. The commenter is given a verification image consisting of letters and numbers, and his comment is published only after he types in those letters and numbers correctly. I never liked the sound of this word – “Captcha” – so I never used it. I’m glad I didn’t. It not only keeps the spam away, but, also discourages genuine commenters from posting a comment. Especially on Blogger blogs. I don’t know why I took so long to figure this one out. It is just a feature that lists all the blogs you follow, in your blog sidebar. When I started blogging, I had a link-list widget in the sidebar, through which I displayed a list of the blogs I used to read. Yupp, I manually added the name and link of each blog in the list. A system in which URLs of all the posts that link to a specific blog post are displayed in/above the comments section of that post. Also, every time you link to a post from a “trackback enabled” blog, a notification is sent to that blog owner that you have mentioned their post. I’ve seen such trackback links on a lot of Wordpress blogs, so I now understand what the term means. But I haven’t seen this on a Blogger blog yet. And I have never received any notification when someone linked to one of my posts. This is when you configure your blog to show only a small excerpt of the post on the index/home page, with a “Continue reading” or “Read more” link, below the excerpt, that leads to the complete post. I took a while to understand what this meant, but when I did get a hang of it, I quite liked it. It gives the readers a quick view of several different posts without too much scroll. Plus it makes the home page look neat and organized. Short for “Really Simple Syndication”. It is one of the simplest ways of following a blog—any blog, be it on Blogger or Wordpress or any other platform. You just subscribe to the blog’s “RSS feed” via email subscription or a feed aggregator app (like Feedly), and it automatically notifies you whenever that blog is updated. There are other ways of following blogs now – Twitter, Facebook, Bloglovin’ – but, RSS still remains my personal favorite. These are some of the terms from the blogging jargon that I found difficult to understand in my early blogging days. Of course, now there are a lot of helpful web resources on blogging for newbie bloggers. Are there any such blogging terms that had you in a fix when you started blogging? Do you still get befuddled by any of the blogging jargon? This is my tenth post for 2015 AprilAtoZ. 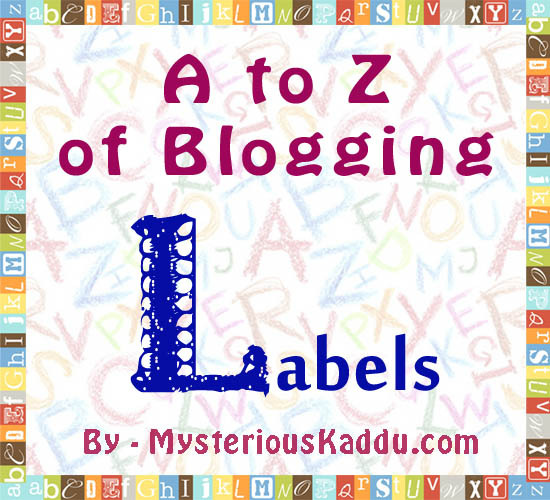 Link to the previous post: A to Z of Blogging: I - Inspiration. Blogophobia - a fear of blogging, of blogs, and of bloggers! Blogathy - derived from apathy; lack of interest and enthusiasm in blogging. In fact, they’ve even come up with specific terms for common habits of bloggers! Have a look! Metablogging – What I’m doing this month… writing articles about blogging. Blog hopping – This is what all of us “A to Z” participants are doing this month… jumping from one blog to another… trying to read and comment on as many posts as possible! Blegging – Begging through your blog, for votes usually, but could be for anything else too. I’ve done it twice here so far. Here’s occasion 1 and here’s occasion 2. Blogstipation – When a blogger gets hit by constipation? LOL! Yeah. Sort of. A mental constipation. More commonly known as the "writers’ block"! Here are some laxatives that I recommend - 10 Tips To Overcome Writers' Block. Blogorrhea – The opposite of blogstipation. This happens when the blogger just can’t stop blogging! I had a severe case of blogorrhea back in 2013, from April to July, when I published 140 posts in 4 months! Blurking – Lurking quietly around blogs, without posting any comments. I’ve got a lot of blurkers here. They come, they read, they leave. :D Actually, I was doing the same thing on other blogs when my blog was off the grid last year. Doppelblogging – Plagiarizing the content of another blog, thereby haunting the original content creator, giving him a few sleepless nights and forcing him to find out ways of reporting copyright violation! Blogoholism - Addiction to blogging. My sister says I’m addicted to blogging. Do you agree with her? This is my eighth post for 2015 AprilAtoZ. 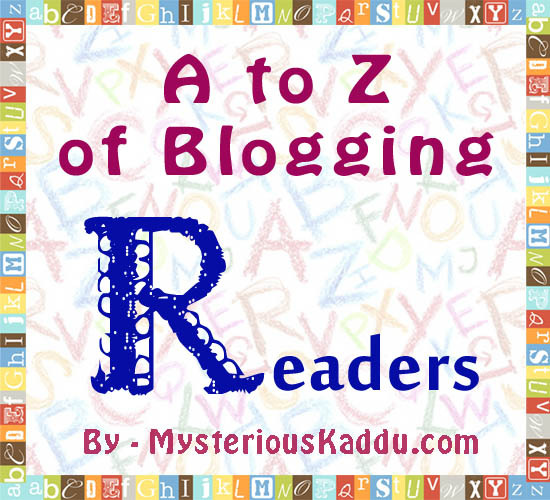 Link to the previous post: A to Z of Blogging: G - Goals.